Hey, what's the worst ingredient combination of which you can possibly conceive that still technically technically counts as "food?" NOPE, DOESN'T MATTER WHAT YOU THOUGHT OF, DEEP-FRIED SPAM DONUTS ARE WORSE. The above picture has not been doctored. There is a crazed spam gunman on the loose in Preston, Lancashire, Whimblybobbles, Bumpley-upon-Scunge, England. 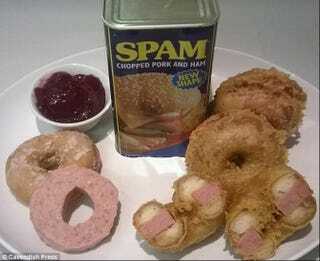 * In honor of Friday's National Donut Day, a guy named John Clarkson has taken regular, non-tragic glazed donuts, cut them in half, slapped Spam in between them in humanity's current closest approximation of a literal turd sandwich, then chucked them in a deep-fryer, because why not at that point? They're essentially spam depth charges, only they're capable of far more horrifying and widespread destruction than their merely traditionally-explosive counterparts. "I am not even a fan of doughnuts to be honest." Yes, Mr. Clarkson, given what you've just done to them, we're all well aware of that. *It's possible I may have made one or two of these up.